Coming April 27, 2019. Take a ride around the Jewel of the San Juan Islands! 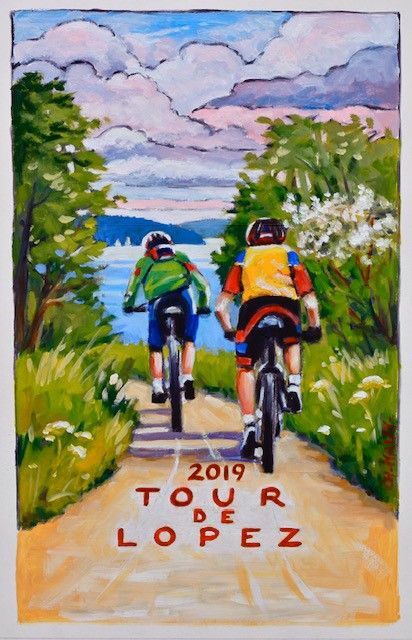 In its sixteenth year, the Tour de Lopez is a family-friendly, untimed cycling event on Lopez Island, the third largest of the San Juan Islands, an archipelago in the northwest corner of Washington state. Referred to by some as the Friendly Isle thanks to its friendly residents, it’s a cycler’s paradise with rolling hills with forests, farmlands, and beaches. Limited to only 900 riders, this popular tour is held on uncrowded roads with route distances of 5, 12, 17 and 31 miles. Registration includes the Saturday ride, 3 refueling rest areas with local bakery yummies and fresh organic fruit, a 3-course lunch, live music, and a beer garden. Grab your bike, reserve your spot on the ferry, and head over to Lopez Island for the Tour de Lopez!